↑ "The Belgian Constitution (English version)" (PDF). Belgian House of Representatives. January 2009. Retrieved 5 June 2009. 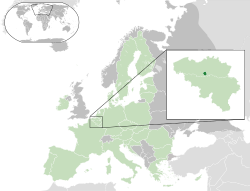 Article 3: Belgium comprises three Regions: the Flemish Region, the Walloon Region and the Brussels Region. Article 4: Belgium comprises four linguistic regions: the Dutch-speaking region, the French speaking region, the bilingual region of Brussels-Capital and the German-speaking region. ↑ "Welcome to Brussels". Brussels.org. Retrieved 5 July 2009.